Anyone know the nearest non-North American source for new (or used) ones? How much to import? Or maybe just a Lifan engine- anyone have experience with them? Last edited by Frank Lee; 02-19-2011 at 03:26 AM.. I occasionally see C70s around here. I have heard good things about the Lifan replacement motors, but not seen one in person. Honda used to carry plenty of 50cc scooters in Europe, but not anymore it seems. The Lifan engines have the same problems as other Chinese made engines, their quality control is not there, so as parts wear out you can almost replace them with Honda parts but the fit is never quite right. Personally I would go for something like the Honda Ruckus/Honda Metropolitan because they have a water cooled 4 stroke that is an very solid stable engine, you don't get the classic look, but if you are looking for a scooter that will last forever they will fit that bill. ^Thanks, I was wondering about that. I know the Chinese are famous for copying everything- even things they shouldn't- without permission. I also know that (as of 10 years ago anyway) they were making decent enough looking copies but their metallurgy and quality control often left a lot to be desired. Hence the "not quite fitting" parts and things that wear out earlier than they would have on the original. I've done a nationwide Craigslist search and was surprised at how little that turned up. Same with Google shopping. Guess I'll hit up the small local and semi-local bike shops to see if they have anything... kinda frustrating that the rest of the world has these things littering the landscape while we can hardly source them no matter the cost. I wish there was an easy way to import a container of Honda Cubs but I suspect the cost of doing so would be higher then you could sell them for, but it might still be worth talking to someone who imports micro trucks and other vehicles from Japan, you would most likely have to source repair parts on Ebay or use the importer that you get the vehicle from. Any reason not to go with something like the Honda Rukus? I wish I still had my Cub 50. I don't remember the gas tank size, but it calculated out to carrying me 142 miles/gallon. I only weighed ~130 lbs back then, and the Cub topped out at 35 mph, downhill. It barely managed 25 mph on uphills. It wouldn't do nearly as well on the uphills carrying Frank, but its downhill speed with Frank might be something else again. 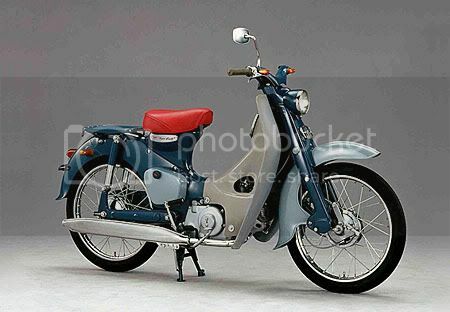 There's a Taiwanese company named Sym that seems to be offering a Cub clone called the Symba (supposedly 150mpg @ a steady 25mpg), but they seem to run ~$2k, which may be too much, and I don't think anyone has driven one enough to determine if they're reliable. HA! Got TWO! Thanks Craigslist!